What chassis number is this car? 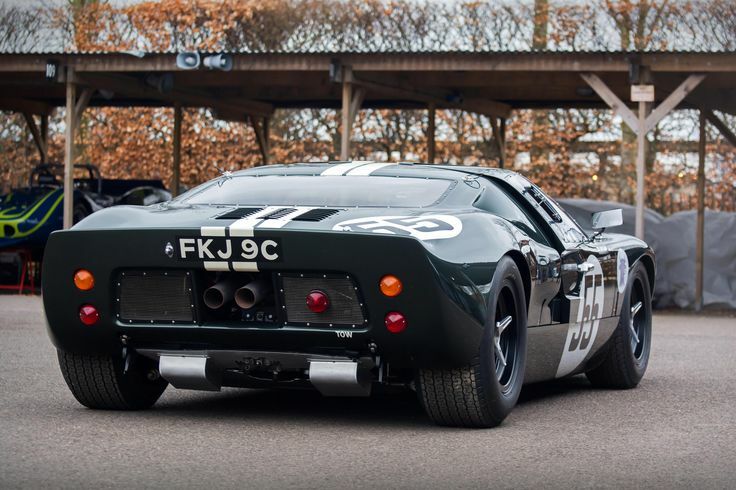 Does anyone know anything about the GT40 owned and raced by Chris Ward and JD Classics? Reg number is FKJ 9C. I have seen the car at several events but cant find out what the chassis number is or what colour the bodywork is. I will try to upload a photo of it. If it is a Superformance, how is it possible to compete in races like the Goodwood Revival??? Are you sure it’s not a Gelscoe? How is it possible for Gelscoe kit cars to compete in the Revival? "There are no replicas at Goodwood"
"There's no betting at Bushwood!" Have any superformance gt-40's raced at goodwood? I saw two as well as several Gelscoe cars at the 74MM. Lee Holman does MK IIs, not MK Is to my knowledge but then I have not talked to Lee in some time. Hell, not even built in the 2000 ought's! As far as I know, HM only built a single continuation MKII which has perpetually been for sale for 10+ years. It may have traded hands a few times but it has never found a true owner as far as I know. I just saw an ad for it for sale in England now. Please correct me if I’m wrong? Superformance Shelby GT40 MkII B, P2183. REDUCED! Titanium/ black LeMans stripes/ yellow graphics. This GT40 MkII B re-creation is one of two ever built by Pathfinder Motorsports, the designers of the Superformance GT40R. The LHD MkII B custom dash in this car is the identical style as the ones that Holman Moody made for the original three MkII B race cars they modified back in 1966 for the 1967 LeMans race. The drivetrain: a modified Roush 351/427IR 575 hp fuel-injected engine tuned by Roush employee and race tuner Cal Hartline, with 4-bolt mains and port-matched aluminum heads. It also has a polished Borla fuel injection unit with custom hand-turned extended velocity stacks and a period-correct high-volume Aviaid baffled oil pan. This also has the new MSD 'FAST' ignition system to include the distributor. Power is delivered through a rugged/ polished German ZF 5-speed gearbox/ transaxle, fitted with smoother/quicker Olthoff shifter-linkage upgrade and Teflon shift cable. Other particulars: 'Gurney bubble,' LeMans stripes, SS [stainless steel] straight pipes to include SS mufflers, and original-correct custom seats made using the original 1965 designs provided by Lee Holman. This exquisite re-creation of the last variation of the GT40, the MkII B, with DNA from the Holman Moody garage is preordained to be the spotlighted centerpiece in its new owner's stable of historic motorcars. Also the MKII built for a Kiwi customer was a combined effort from Pathfinder, SPF and HM for the Chris Amon continuation car. If nothing else a much more period correct car due to T44 & FE engine combo than all the Hot Rod stuff in above example. Right. That one car is the only Holman Moody built continuation car that I know of. I’m not talking about Superformance or any other replicas, or SPF cars where HM provided components such as engines or gearboxes. I am talking about 100% Holman-Moody cars. If there are any others besides this one, I’ve never heard of them? Interesting to see the owner of the Roadster in the HM article is 'Alan Watkins', is that the same 'Alan Watkins- User Resigned' who used to partake here on GT40's... IIRC he had an SPF, is his roadster based on that? here they state "The Holman GT MKII, chassis #P201, soon after completion in 1992"
Chassis GT40P 204 will be a copy of the Mark II Sebring winning Roadster"
Don't know which chassis# the red roadster has! 203? I have seen (and picture proof) Gel 003 and Gel 007 raced at Goodwood Revival. Also Mirage M10002 was a Gelscoe replica, but I am not sure if it actually raced or just demo.